My carpet is actually fine, but I'd love to change it out to either snap out or something like sea dek - however what little info I could find suggest it can be quite the process on this particular boat due to carpet edges. Has anyone with this series boat replacement their carpet with a product like sea dek ? Cost? DIY? Dealer Install? I'm sorting out my upgrades for the 17 season. I just purchased a SSV24 and am looking to do the same thing but I'd be going with Sundeck because I've never liked carpet and that wonderful early morning mildew smell. I'd also be interested if anyone has DIY'ed this or paid for it. Also looking for the same information...especially around seadek! 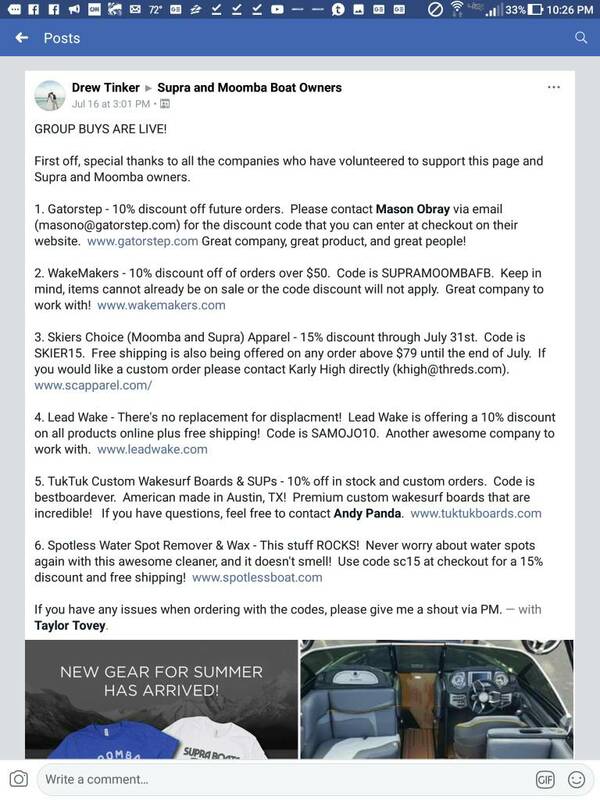 Gatorstep was offering some discounts to Supra people. It was posted on Facebook. I can see if I can find the name and phone number.